The only traveling educational art exhibit of its kind in Utah, the UMOCA Art Truck brings exciting and accessible contemporary art, created by leading local and national artists, directly to schools and community venues across the state. Each on-site visit by the Art Truck includes the expertise of a trained museum art educator who leads students through a meaningful exploration of the current exhibition. Teachers are provided with structured lesson plans to supplement their tour and incorporate the Art Truck more deeply into their curriculum. 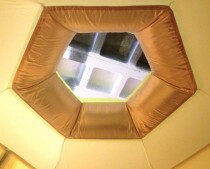 Festooning: Enter the Beehive // Art Truck Residency Utah Museum of Contemporary Art from Maria Molteni on Vimeo. Maria’s vision for this year’s Art Truck called upon the Festooning teaching concepts she’s used in past works including Festooning the Inflatable Beehive (collaboration with Colette Aliman). The root of the word FESToon comes from *feast or *festival, and refers to an abundance of material that is so plenty, it falls off the table and drapes indulgently and ornately. The festoon was used in many historic art and architectural motifs, but is now an interdisciplinary term referring to any system that reflects this undulating structure. The way that scalloped chunks of comb drape inside beehives mirrors the ways bees string their bodies together between the frames of comb to build cells, a practice called festooning in the beekeeping world. Beyond beekeeping, festooning refers to the manner in which teeth attach to gums, strings of islands sit in the ocean, electrical wiring hangs, and party flags adorn a room. This particular installation benefits from the environment of the box truck which is much like a modern, filing cabinet-esque, Langstroth beehive- a simple dark box in which bees build channels of draping honeycomb. Inside the Art Truck, sculptures are hand plaited cotton roping that hang like scalloped festooning or natural honeycomb. The walls outline the way bees see and how this helps them find flowers to pollinate and forage. At the height of a student’s tour through the box truck bee hive, the lights are shut off to reveal black lights and sensitive painted imagery, previously unseen at the end of the visible spectrum illustration. This is because bees see higher wavelengths just beyond what humans can see. This ultraviolet vision reveals hidden designs and landing patterns on flowers, one of many senses that the highly evolved honeybee uses to perform their work efficiently. Students are encouraged to think about the special ways that we each see the world and how, as artists, we might represent our special visions. Students can pull from a variety of floral patterned fabrics attached to Langstroth hive top bars and draw from observation. They may also draw other Festoon structures or designs on all of the Chalkboard painted walls. Participants take away a greater understanding of our communal power, a motivation to engage responsibly with other species, and the ability to make cultural and conceptual connections between seemingly separate fields of study. Teachers can and do develop further lesson plans in their classrooms, whether they teach science, math, social studies or spelling! The Art Truck has seen over 1400 people in the last month… busy, busy! I don’t think we’ve ever had quite this level of excitement about an installation before. Teachers have been very inspired by the theme, doing offshoot activities in their classrooms.